Abstract: Gastric volvulus is the abnormal torsion of the stomach along its short or long axis. Most patients who experience gastric volvulus present with mild or intermittent gastric obstructive symptoms. However, severe acute gastric volvulus can result in complete gastric outlet obstruction and ischemia. Consequently, acute gastric volvulus warrants immediate evaluation and management. The goals of management are to relieve the obstruction and prevent recurrent volvulus. Techniques to manage gastric volvulus depend on patient characteristics and the presence of gastric ischemia. 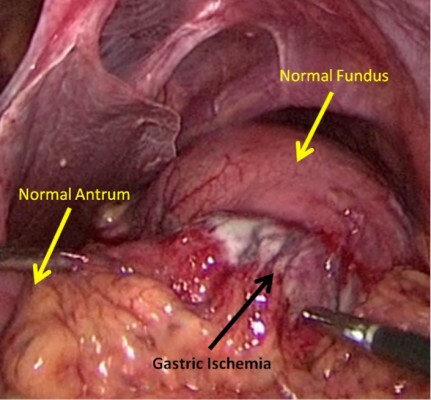 In the absence of gastric ischemia, gastric volvulus can be managed with anterior abdominal wall gastropexy or paraesophageal hernia repair. If gastric ischemia is present, operative resection of the affected portion of the stomach is indicated. When operative management is indicated, many patients with gastric volvulus can be managed with minimally invasive (laparoscopic, endoscopic, or laparoendoscopic) techniques.